A fast and damaging half forward flanker, Jim Williams was a core member of the unstoppable Launceston combinations of the mid 1930’s. Known to all and sundry as ‘Dodger’, Jim Williams was a champion schoolboy footballer who first represented his state in 1927. 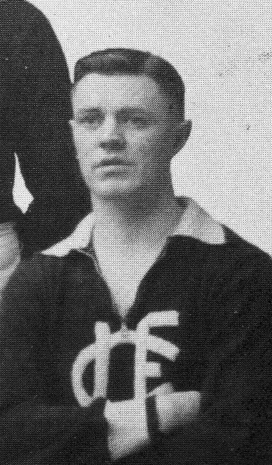 Upon leaving school, Williams contented himself by playing in junior suburban leagues around Launceston during the Depression years, before finally making his way to the Launceston Football Club, debuting for the Blues in senior football senior debut in 1932. His arrival was well-timed, as the following year under new coach Leo McAuley Launceston embarked on one of the most dominant periods in the history of Tasmanian football, capturing six consecutive NTFA premierships from 1933-38, as well as five of the six State premierships on offer during that period. Williams was an ever-present member of these teams, playing in 10 of the 11 premierships Launceston captured. As well being a fantastic servant for his club, Williams was also a star performer in representative football. He appeared more than 15 times for NTFA combined teams over the course of his career, and also managed five matches for Tasmania, though unfortunately never had the honour of representing his state at a National Carnival; his best chance should have come in 1937, but with that year’s Carnival being held in Perth, Tasmania was one of a number of second-tier states who could not afford to send a team across the country. After the club’s golden era, Williams continued to play his role on a half forward flank with aplomb, playing in another premiership in 1940 before the NTFA was suspended by the Second World War. When the Association resumed in 1945, Williams resumed along with it, but played only one season before retiring after 112 games for the Blues; he went out on the highest possible note, playing in his eighth senior premiership.